What Is The Difference Between Grease Interceptor And Grease Trap? You would have generally heard people using the terms grease trap and grease interceptor synonymously. It is true that both the equipment are used as grease removal units that keep the FOG out of the drainage line of any food establishment by capturing it. But technically, there is a marked difference between a grease trap and grease interceptor. Understanding the difference between both allows the owners of a commercial kitchen to maintain their grease removal units more comprehensively. In fact, this information becomes more important when you are establishing a new commercial kitchen or retrofitting one. So, to help you get out of this ambiguity, let’s discuss their specific roles and maintenance requirements in detail. Grease traps are small FOG removal units that are used where the flow of water and the residual grease from the kitchen is low. They are customised to operate in a low water pressure environment with the flow rate between 10 to 50 gallons per minute. The size of the grease trap is small, varying from a small iron box to as big as a mini-fridge. They are installed inside the kitchen, generally beneath the sink. As grease traps are small sized units they get filled up quickly. This means they need to be emptied and cleaned more often. In general, a grease trap needs to be cleaned at least once a month. However, the frequency for cleaning significantly depends on the amount of grease generated in the kitchen. For example, some of the busy restaurants clean the equipment twice or thrice a month. Regular maintenance of grease trap keeps it working efficiently for years. In point of fact, it is a mandatory task laid by state or city regulations on the owners of commercial kitchens. A grease interceptor is a big size FOG removal unit. This unit is ideal for the use in large-scale food establishments where a large amount of grease is generated. The equipment is designed to operate in a high-pressure water environment with a flow rate of more than 50 gallons per minute. Owing to the big size they are installed outside a food establishment, usually beneath the concrete (underground). As the capacity of grease interceptors is greater than that of grease traps, they are able to gather more amount of grease in a longer period of time. Hence, grease interceptors need to be emptied and cleaned at least once in three months. Again, the maintenance schedule depends on the amount of grease generated in the kitchen. 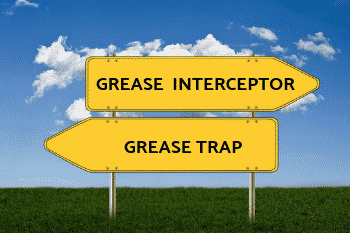 But compared to grease traps, interceptors need less servicing. In broader terms, the maintenance schedule of grease traps and interceptors can range between one and three months. But to be more accurate, you can use the 25% rule (also known as the ¼ rule). The 25% rule is a universally accepted standard that helps you determine the schedule. It affirms that any grease removal unit (big or small) needs to be cleaned as soon as it gets filled up by 25%. This is important because the unit becomes ineffective after 25% of its tank space is occupied by grease. If the grease trap or interceptor is not pumped out at this stage, it is more likely that the food establishment has to face a high risk of blockages and backups. Adhering to this 25% rule will ensure that your FOG removal unit keeps operating at its optimum capacity for years together. Clean the equipment before or after the business hours to avoid the unpleasant odour disturbing the customers. Recycle used cooking oil instead of throwing it to reduce the frequency of pump outs. Ensure that only the residual FOG from cooking is disposed of in sink. For this, plates and utensils should be scraped off to avoid the unnecessary amount of waste making way to the trap/interceptor. After knowing the difference, you might have understood, which grease removal unit can meet the requirements of your food establishment. 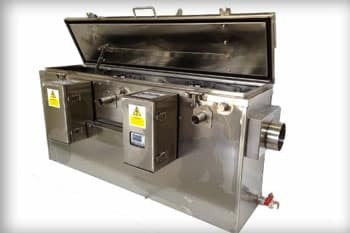 If you need more details on it, Grease Guardian is there to provide custom-made grease interceptor/traps by investigating the size and other specific details of your commercial kitchen. You have one already installed? No problem! You can reach out to Grease Guardian for any post-installation problems. Grease Guardian offers inclusive solutions to the installation of grease removal units. Besides supplying the equipment, they provide pre and post-installation services that determine the efficiency of the operations. The company manufactures the equipment using stainless steel which makes it durable and long lasting. It offers automated equipment that makes the cleaning process a less annoying task. In general, grease traps and interceptors enhance the life of your septic tank. It promotes the good reputation of your business in public creating a positive status. Hence, these become a selling point to show that your commercial kitchen works in compliance with the law and is doing its bit to help the environment. 1. D7 ASRD M – This grease removal unit is ideal for marine applications including small vessels to cruise liners. It is designed using intelligent technology that enables self-cleaning and automatic transfer of solid waste. With automatic grease removal unit like this, it becomes very easy to install and maintain. Planning to install a marine grease trap? 2. D10 ASRD M is another FOG removal equipment designed to meet the needs of marine vessels. Just as D7, it is integrated with self-cleaning technology and other extensive numbers of automatic features including sensors. Want to understand its functioning? Apart from marine applications, Grease Guardian has a variety of products to choose from. The company supplies grease traps and interceptors even for under sinks, ovens, and basements. It is never too late with grease traps/interceptors. If you need to install one, replace it or get over any grease related challenges, our consummate team of professionals can help you.